In this lesson students make their own newspaper for Father's Day. Everyone has to make a front page with a fanciful name and three other pages. We gave them six categories (weather, sport, shownews, news from the city, a comic and a puzzle). The rest of the pages had to be filled with self chosen articles. The articles can be written by hand or on the computer. 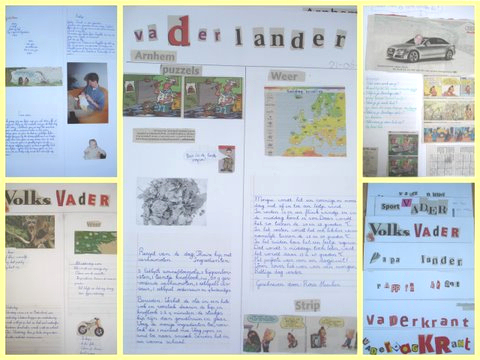 During this project several subjects come across: language, spelling, writing and illustrating. But also themes like layout, headlines, editing, editor and journalist can be discussed. We worked several weeks to complete these newspapers.